Be sure to check out all the cute cupcakes from last week on Cupcake Tuesday! Brilliant! 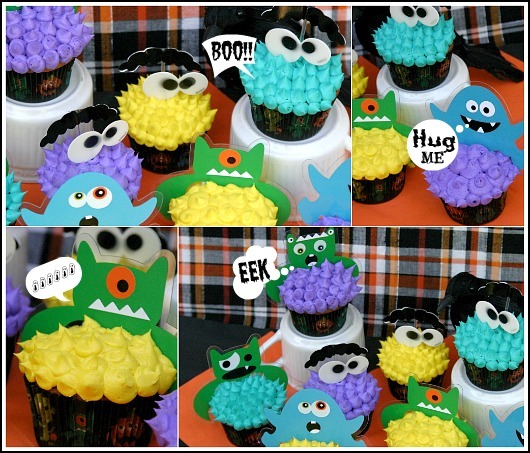 What better way to kick off this fun filled month, than with these Slime Filled Monster Cupcakes! 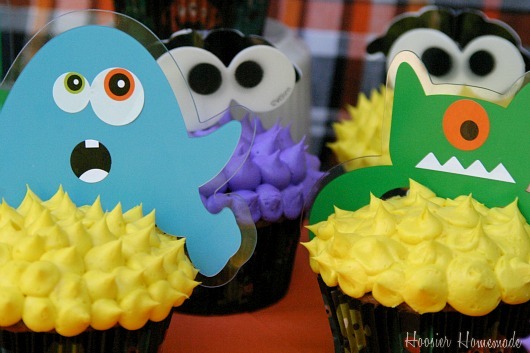 Along with the other Wilton goodies for the giveaway, I received these adorable Monster Fun Pix. At first glance, they just seem like the usual, ordinary cupcake picks, and even the outside of the package doesn’t give you the whole picture. But after I opened the package, the fun started! I think they are simple adorable! Can Monsters be cute and cuddly? I suppose so…they were in Monsters Inc., weren’t they? The fun face monsters are made from hard plastic and come with a set of cute stickers to make the different faces. I love these! I truly enjoyed creating these little guys! I even called Doug and the boys into the room and had them create a Monster too! 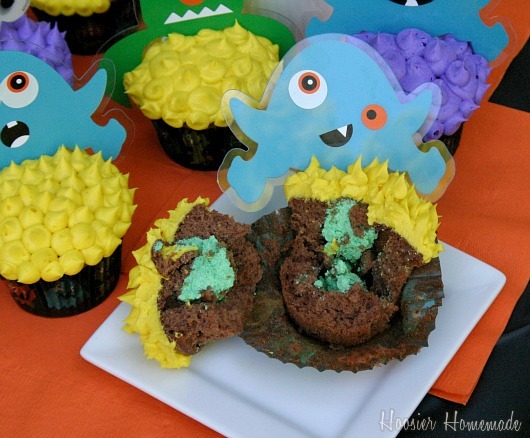 Not only are they super fun to create and quick, they are very reasonably priced, you can get both set of Monster Picks, and the Monster Baking Cups for under $10. 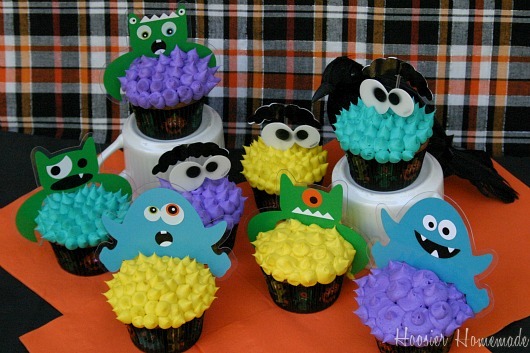 Just add the cupcakes and frosting and you have an adorable set of Halloween Cupcakes! The googley eyes and eye brows are on a pick and you just simply add them to the cupcake. Stay tuned to see what other quick little project you can use them on. Won’t your kiddos have a blast creating some too? Slime Filled Monster Cupcakes for Halloween from HoosierHomemade.com. After cupcakes are cooled, use an apple corer to make a hole in the center of the cupcake, being careful to cut only about 3/4 of the cupcake. Note: I used Lime gelatin because that is what I had in the pantry, but if you don’t want the lime flavor, you can use unflavored gelatin and the green coloring. Stay tuned for more Halloween Fun the rest of the month! Now it’s your turn…show off your cupcake creations! Be sure to link back so others can enjoy the cupcakes and check out the other cupcakes! 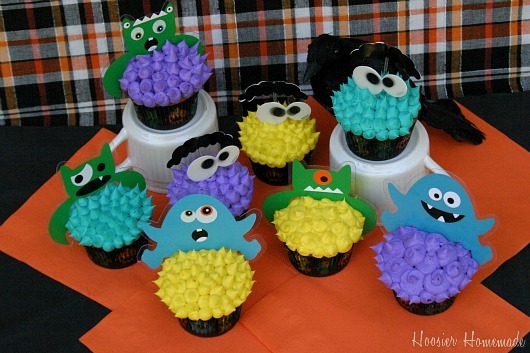 cool monster cupcakes! just saw them on CTTC! great job! These cupcakes are so cute! Worthy of a top bakery item. These monsters are fun and adorable! These are such fun looking cupcakes! I love what you did for the filling! As always, thanks for hosting Cupcake Tuesday!